Public attitudes to immigration have influenced policymaking, most recently during the European migration crisis and in the Brexit referendum. Studies of immigration attitudes have focused on the responses to survey questions about whether the individual would prefer more or less immigration, but not on his or her assessment of its importance as a policy issue. In a recent paper, I distinguish between ‘preference’ and ‘salience’ (Hatton 2017). These dimensions of opinion are very different, and both are important for policy. Public opinion on immigration has often been assessed by analysing survey questions that ask whether the respondent would prefer more or less immigration. This is a measure of ‘preference’ over immigration, and its individual-level correlates have been widely studied. Less attention has been given to the ‘salience’ of immigration, i.e. whether the respondent regards it as an important policy issue. This is important from a policy perspective – policy may deviate widely and persistently from voters’ preferences on issues with low salience. But if salience is high, then voters’ preferences will have greater political traction. Yet these two elements of opinion have rarely been compared. If they capture the same underlying sentiments, then preference may be a good proxy for salience and vice versa. But if not, then both should be taken into account when assessing the likely effects of public opinion on immigration policy. The measure of preference is taken from the European Social Survey. For three different immigrant groups the survey asks if the respondent would like to see many, some, a few or none admitted. I take ‘a few’ or ‘none’ as representing anti-immigration preference. The measure of salience is taken from the Eurobarometer survey, which asks: “What are the two most important issues facing our country?”. Immigration is salient if it is one of the two chosen from a list of 14 policy issues. Thus salience is a measure of importance relative to other political priorities. 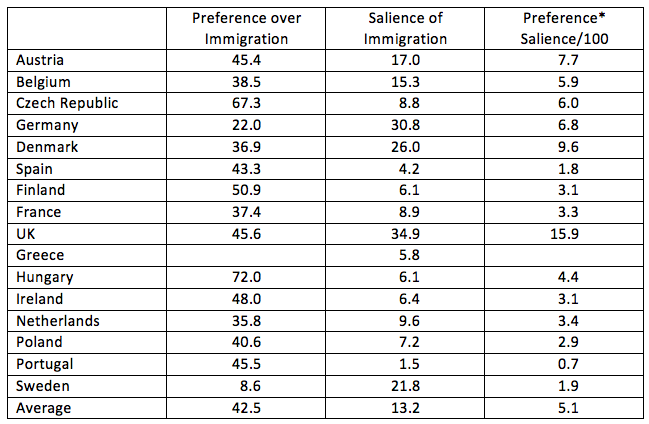 Table 1 shows that in 2014, anti-immigration preference varied from less than a quarter in Germany to nearly three quarters in Hungary. And while the salience of immigration was less than 5% in Spain and Portugal, it was over 30% in Germany and the UK. Overall, there is a correlation of -0.48 between preference and salience. Sources: Preference is calculated from the 2014 European Social Survey as the average of responses to three questions relating to immigrants from the same ethnic group as the majority population, from different ethnic groups and for poor countries outside Europe. Salience is calculated from the Standard Eurobarometer, spring and autumn rounds. See Hatton (2017). The last column of Table 1 creates an index of opposition to immigration calculated as the product of preference and salience. The UK stands out in this index with a value more than three times the average. This goes some way to explain why the UK (and its government) is sometimes seen as more anti-immigrant than other countries. Although UK anti-immigration preference is only slightly higher than the average, salience is very much higher than the average. By contrast in Germany, where salience has recently been on the increase, anti-immigration preference remains low and so the overall index of opposition to migration is not particularly high. A large literature examines the correlates of anti-immigration preference at the individual level (Hainmueller and Hopkins 2014). The most robust finding of this literature is that anti-immigration preference is negatively related to the individual’s education level. That may be because more educated people are more liberal and tolerant or because they are less likely to face immigrant competition for jobs. This finding is confirmed in regressions exploring the drivers of immigration preference using the European Social Survey, where the education effects are large and highly significant. Is the same true of salience? Regressions of the salience of immigration on personal characteristics produce very different results. The effect of education is much weaker and the effects of other variables differ too. So, at the micro level, there is very little similarity between the characteristics of those with anti-immigration preferences and those that consider immigration to be an important issue. This also holds if the question on the ‘most important issue’ in the survey applies to the respondent personally rather than to the country as a whole. Do anti-immigration preference and the salience of immigration move together over time? Using data from 17 European countries, the average year-to-year correlation of preference and salience for the period 2002 to 2014 is just 0.1. But there are positive correlations of more than 0.6 for the Czech Republic, Denmark, Finland, and the Netherlands, and negative correlations of more than 0.6 for Austria, Germany, and Sweden. So there is no stable relationship between preference and salience. Figure 1 compares preference and salience for six countries. Salience declined in the aftermath of the Global Crisis as economic concerns came to the fore. This goes some way to explain why there was no anti-immigration backlash as the Great Recession unravelled in 2008-10 (Hatton 2016). Since then, salience has increased steeply in Germany, the UK, and Sweden, but not in other countries. Meanwhile, there has been some uneven downward drift in anti-immigration preference. Source: European Social Survey, 2002-2014 and Standard Eurobarometer, 2002-2014. See Hatton (2017). There is some evidence that salience is relatively volatile in the short term, and that this is linked to variations in press coverage. Media frenzies over immigration-related events or controversies often raise awareness of immigration and increase its salience. Regression analysis shows that while salience is related to ups and downs in the flow of immigration, preference is more closely related to the immigrant stock, which evolves more slowly. Do variations in preference and salience influence immigration policy? It seems almost self-evident that policymakers should respond to trends in public opinion, but the evidence is limited. Some studies find a link between local press coverage and the voting behaviour of legislators (Facchini et al. 2016), while others find that immigration shocks lead to increased support for far-right political parties (Otto and Steinhardt 2014). Immigration policy is subject to a wide variety of influences operating with long and variable lags. But for the European countries examined here there is weak evidence that increases in both preference and salience lead to more restrictive policies, as measured by an index of immigration policy. Increases in salience also seem to lead to tougher rules on asylum. But such findings are tentative and require further study. Facchini, G, T Frattini and C Signorotto (2016), “Mind what your voters read: Media exposure and international economic policy making”, CEPR Discussion Paper 11282. Hainmueller, J and D Hopkins (2014), “Public attitudes toward immigration”, Annual Review of Political Science 17: 11.1-11.25. Hatton, T J (2016), “Immigration, public opinion and the recession in Europe”, Economic Policy 86: 205-246. Hatton, T J (2017), “Public opinion on immigration in Europe: Preference versus salience”, CEPR Discussion Paper 12084. Otto, A H and M F Steinhardt (2014), “Immigration and election outcomes: Evidence from city districts in Hamburg”, Regional Science and Urban Economics 45: 67-79.